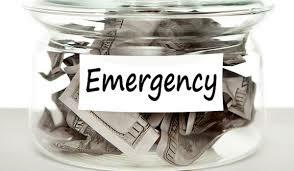 An emergency fund by nature should be liquid and accessible at short notice. A classical emergency funds should be 6 months of your expenses , while this sounds simple the tricky part is to figure out what to include in these expenses , typically you can pick up your past 6 month expenses and than add a multiple of 10 % inflation and keep that as emergency funds,or you can list down all the key expense heads and project what money you require for each of them, this can include groceries, utilities, entertainment, mortgages, insurance etc. Zero Risk : Emergency funds should be parked in assets which have zero risk, In most cases what this means is that you will have to contend with lower return, but primary priority for emergency fund is assured availability whenever you require it, Savings accounts, Fixed deposits, recurring deposits etc. Accessibility: If there is an emergency, you need your money immediately any asset class which gets you money immediately, for example Fixed deposits may take time, short term debt funds also take 2-3 days to get money into your account. We also recommend you to carefully analyze your expenses to identify the right size of emergency funds, and lastly never get greedy with assets you invest in.